Bengaluru, 29th July 2017: In an exciting final day at the FIBA Women’s Asia Cup, Japan achieved a 3-peat topping Australia. China clinched third place defeating South Korea. 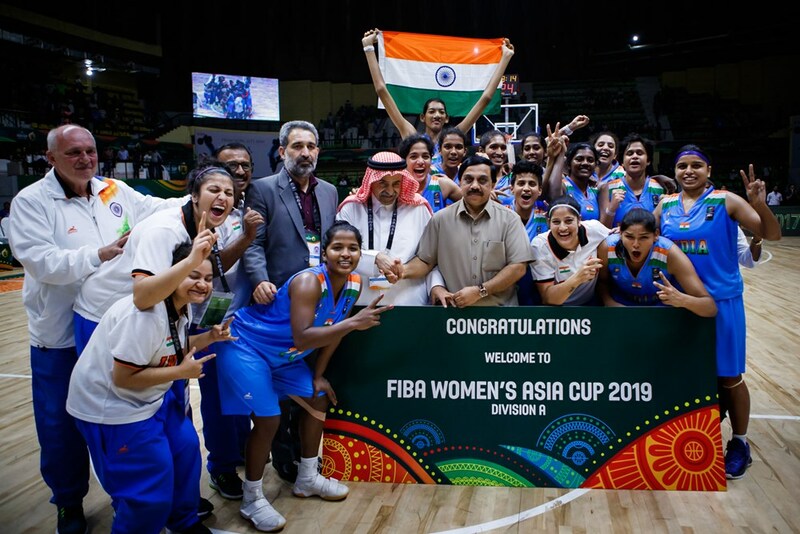 The Indian women’s basketball team has been elevated to Division A after beating Kazakhstan in a thrilling finale. BFI President K Govindaraj has announced a cash prize of INR 15,00,000/- to the Indian squad. Australia’s Kelsey Griffin was named the Most Valuable Player of the Cup. Japan’s Manami Fujioka and Moeko Nagaoka, China’s Li Yueru and Korea’s Lim Yung Hui, along with Griffin were announced as the Asian All-Star five. The long awaited final of the FIBA Women’s Asia Cup saw defending champions Japan take on powerhouse Australia in a clash of titans. While Japan has won the last two editions, this is the first time this event is also featuring the Oceania teams. World number 4 Australia had defeated Japan once before in the league stages and were looking for a repeat performance today. Australia started the game shooting lights out from the field. A couple of triples and skilled post play by Kelsey Griffin gave Australia a 12-4 start early in the first period. But Japan quickly regrouped and began to find open shots. Captain Maki Takada contributed 7 points in the first and Japan evened things up. The first quarter ended with both teams at 17 points. Entering the second half down by 6 points, Japan’s Saki Mizushima caught fire, hitting three crucial triples. Australia continued to channel their offense through the post play of Griffin and captain Tolo. Griffin was especially effective, powering her way to the basket and displaying her bag of tricks in the post. In the final period, Mizushima hit some unbelievable contested triples and provided the scoring impetus for her team. Down to the final minutes and the game tied at 71 apiece, Mizushima hit another clutch triple putting Japan up by 3. On the next possession, Australia’s Griffin hit a layup off an offensive rebound, but Japan held on to a 1-point lead and clinched the nail-biter. Mizushima was the star of the game for Japan with 26 points, including seven 3-pointers. Kelsey Griffin had 30 points and 15 rebounds in the loss and was named MVP of the tournament. Japan achieved the 3-peat downing the Australia challenge. Japan coach Hovasse was ecstatic after the victory, probably the biggest of his career as a head coach. 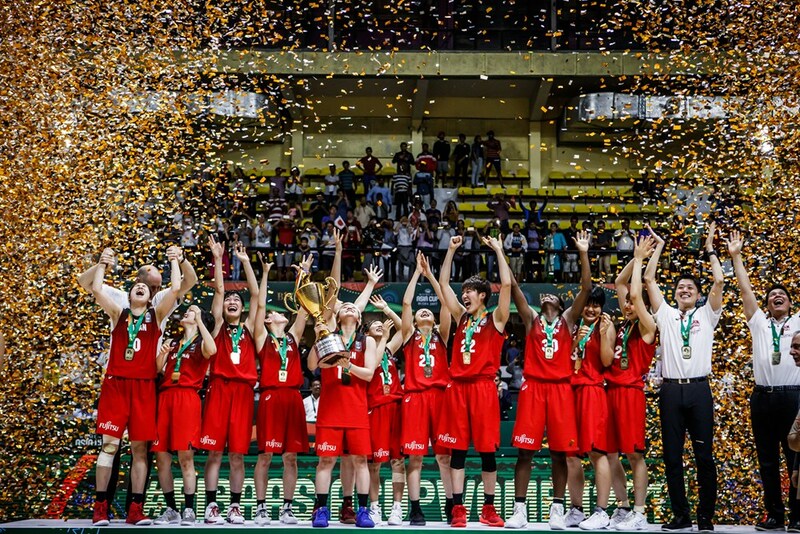 After losing out a place in the final in a heartbreaking loss against Japan, China was gunning for a third place finish. They took on South Korea in the third place game today afternoon. In the first half of the game, there was not much to separate the teams. The centres provided the scoring for both teams – Yueru Li for China and Jisu Park for Korea. But in the second half, fatigue started to show for Korea. China showcased their superior fitness and kept attacking through multiple offensive options. 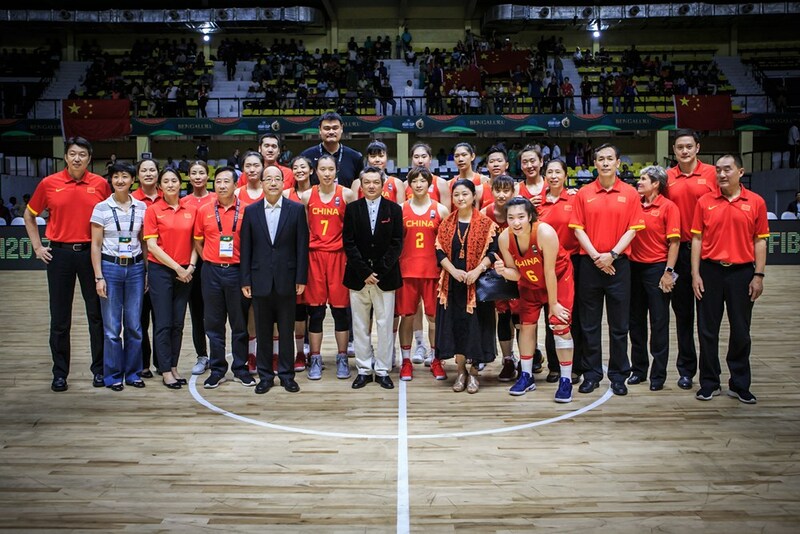 China dominated the second half, outscoring Korea 34 to 17 and clinching a 75-51 blowout win. China centre Yueru Li had a double-double of 16 points and 11 rebounds in the victory, while Jisu Park also had a double-double of 14 points and 11 rebounds for Korea in the loss. In the battle for 5th place, Chinese Taipei got the better of New Zealand. The Asians got off to a spectacular start, outscoring the Tall Ferns 20 to 4 in the first quarter. Thereafter, it was a matter of holding down the fort. Taipei capitalized on NZ’s 20 turnovers in the game to score 21 points therefrom. NZ could not recover from the slow start and Chinese Taipei ended up blowing out the Ferns for a 65-45 victory. Ting-Jen Huang and Hsi-Li Bao had 10 points each for Taipei in the win. Newcomers to Division A, Philippines, retained their spot among the best in Asia with a win against DPR of Korea in their Division A relegation match. Philippines had a huge second quarter scoring 29 points compared to Korea’s 10, which set the tone for the rest of the contest. Allana May Lim top scored for the Perlas with 16 points, while Cindy Resutay put up a double-double with 10 points and 10 rebounds. Mi Hyang Kim had 20 points for Korea in the loss. After a winless campaign, Korea now see themselves relegated to Division B. The Division B final was a clash between two undefeated Division B teams, India and Kazakhstan. The two teams were meeting for the first time in the tournament. With the winner getting promoted to Division A for the next edition of the FIBA Women’s Asia Cup, both teams came out hungry for the victory. Kazakhstan held the size advantage over the Indian team and this was punctuated by the play of Kazakh centre Nadezhda Kondrakova. She was able to score from inside and outside to begin the game. For India, the scoring came from a balanced team effort. Shireen was aggressive on her drives to the basket, while guards Paul Durai and Raspreet created space to knock down their jumpers. Kazakhstan held a slim 3-point lead entering the second quarter and the built on it immediately. Tamara Yagodkina hit a couple of big triples in the second period to build on the Kazakh lead. Centre Kondrakova and forward Kurazova were attacking the boards for Kazakhstan, leading to multiple second chance opportunities. Kazakhstan ended the first half with another buzzer-beating triple and extended their lead to 8 points (39 to 31). In the third quarter, the Kazakh offense continued to flow from bigs Kondrakova and Kurazova. But India slowly started to find their offensive rhythm. Shireen and Raspreet hit a couple of jumpers to give India some momentum. Debutante Grima Merlin came off the bench to provide an offensive spark with her strong drives to the basket. Shireen punched in a triple to end the third quarter, holding the Kazakh lead to 8 points again. In the fourth, India began with a 6-0 run, with Paul Durai and Raspreet hitting a triple each. Grima followed it up with another shot from beyond the arc and the Kazakhs were thrown off their game. With the lead finally down to just one point, Jeena stepped up to give India the lead with a nifty move in the post. But Kazakh centre Kondrakova continued to fire, playing to her strengths in the post against the smaller Indian defenders. It all came down to the final minutes, when Kazakhstan arrested a 5-point lead, with a bucket from Kondrakova followed by a huge triple from forward Oxana Ossipenko. But the Kazakh lead was soon cut down by a Shireen layup followed by a Jeena and-1 drive to the hoop. With the game tied at 71 apiece, both teams exchange buckets – Shireen from India and Oxana from Kazakhstan. There was 19 seconds left in the game and possession belonged to India with the ball in the hands of India’s MVP in the game, Shireen Limaye. Despite being a scambled play, Shireen managed to create space and hit a deep stepback jumper, putting India up with under a second left. The last ditch effort from Kazakhstan was to no avail and India secured a historic win, advancing to Division A of the FIBA Asia zone. “All the hard work over the past 5 months paid off!” said India star Limaye after the thrilling victory. In the Division B classification games, Singapore beat Fiji 80-65 to secure 7th place. Zhi Lim’s 26 points led Singapore. In the 3rd/4th place clash in Division B, Lebanon defeated Uzbekistan 59-55 to secure a top 3 Division B finish.